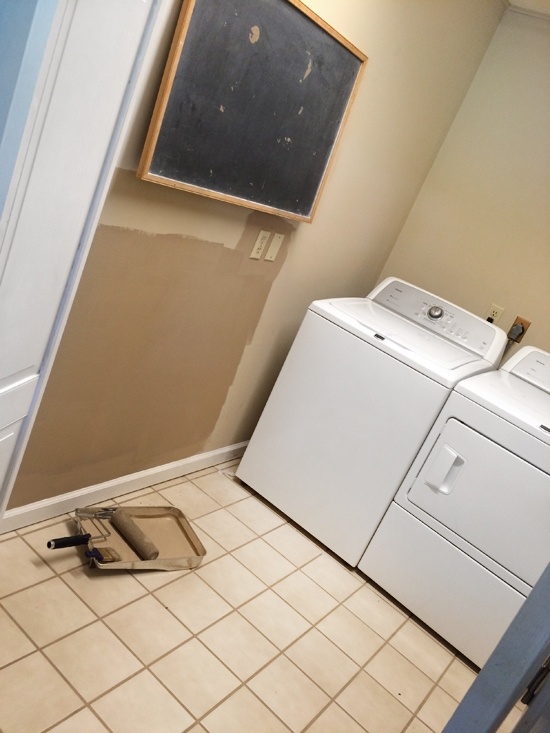 I know I’m supposed to be showing you guys my completed laundry room makeover (especially after revealing the painted laundry cabinets almost two months ago), but I still haven’t finished the space. Instead I’ve put my own house on hold so I could turn the attention on my parents’ laundry room. Best daughter ever, right? So I’ve mentioned before that almost every Sunday my family gets together for dinner at my parents house (and not forced to attend, we actually enjoy it!) and my mom goes all out with a theme for each dinner… I’m talking a set of dishes for every holiday or family event like Valentine’s Day, 4th of July, Mardi Gras, seafood, Mexican, Cardinals baseball… A LOT of dishes! 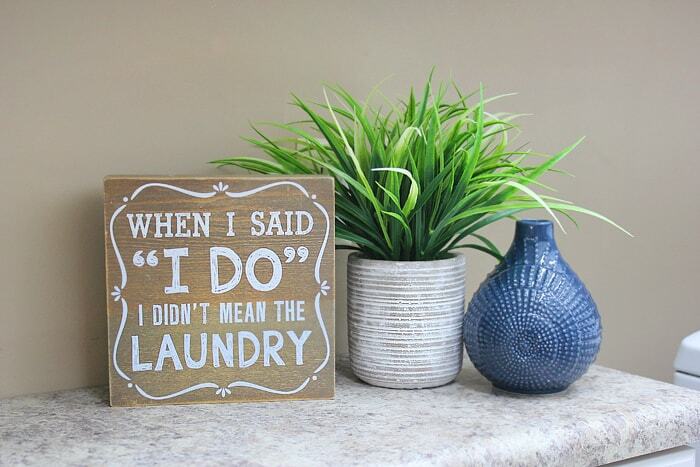 OK… so what does the laundry room have to do with Sunday dinners? Well since the laundry room is along the hallway between the dining room and kitchen, it seemed like the perfect place to add some storage for her growing collection. 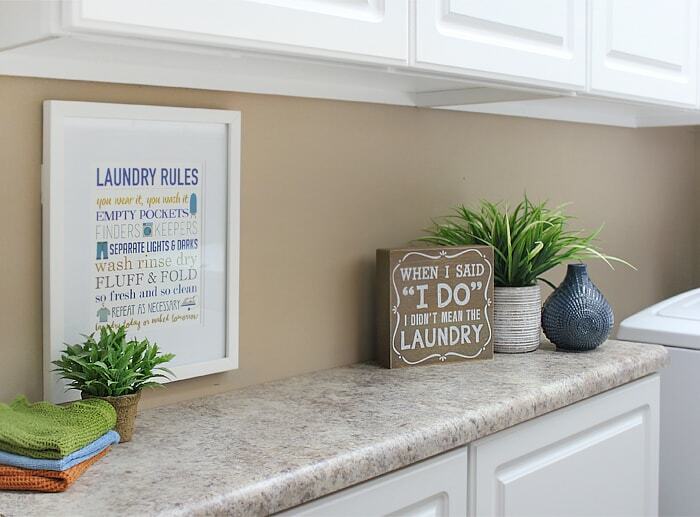 Enter the laundry room makeover. 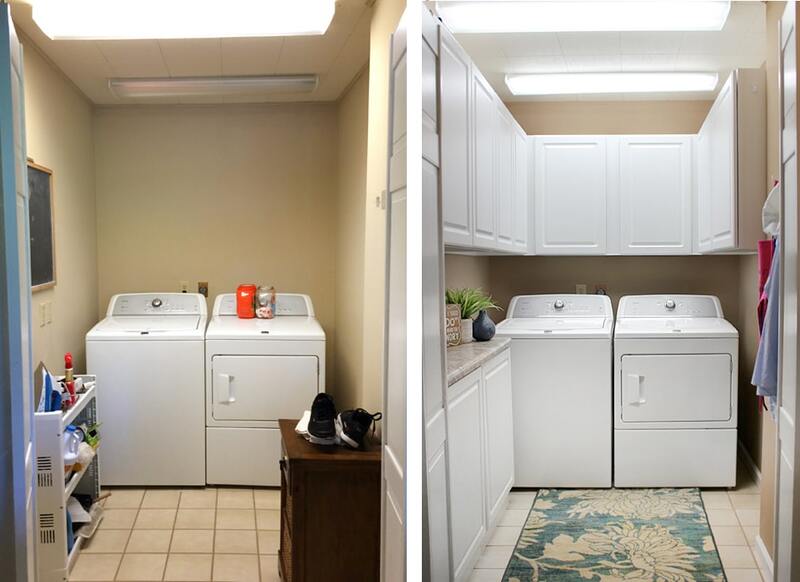 I started this laundry room makeover by giving the entire laundry room a quick coat of paint to freshen up the space. We chose Latte by Sherwin Williams, a great neutral brownish color. I also tore down that chalkboard… tons of fond memories playing school with my sister in this laundry room when we were little! To finish off the space, I sketched out some cabinet layout ideas for my mom in Photoshop and we took some measurements. 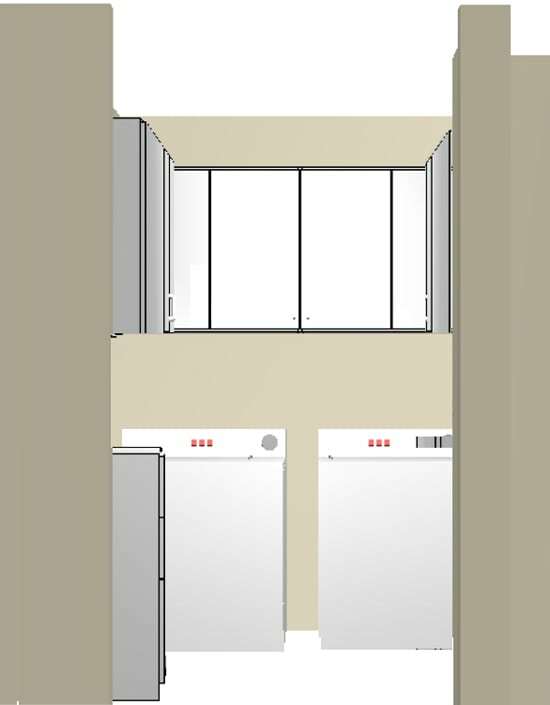 She had some weird little wall niches in the laundry room and we tried to work out a cabinet plan around that; mostly upper cabinets along 3 walls with some base cabinets on the left side with a small countertop. We then took our laundry room makeover plan up to Lowe’s to buy the cabinets. They were really helpful in tweaking the cabinet sizes & measurements to fit the space and helped us create the perfect plan. We ordered all of the cabinets and Lowe’s came to install them a few weeks later! And here’s how the room looks today! On the left side is the base cabinet with countertop. Very small and narrow (only about 12 inches deep) but still a great space to have. The countertop color is Belmonte Granite by Formica, same thing I have in my old kitchen and current kitchen! 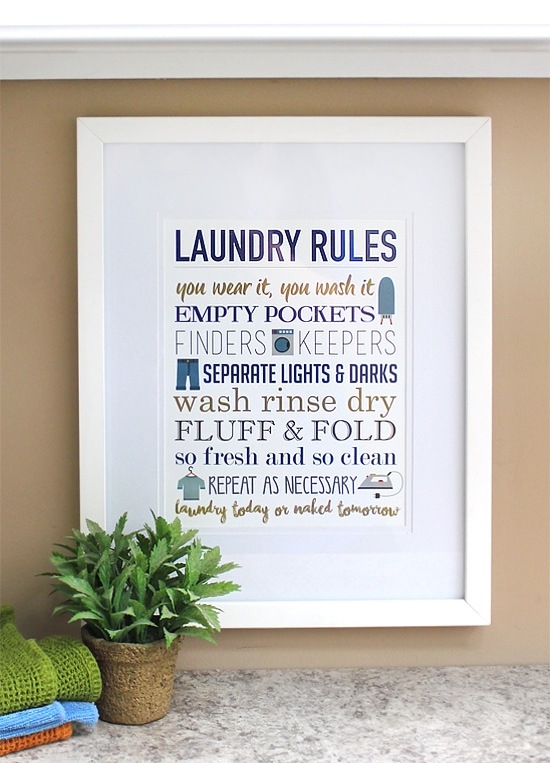 I created a new Laundry Rules printable for my mom’s laundry room and hung it on the left side of the laundry room above the countertop. I’ll share it for FREE with you guys on Wednesday! Then on the other side of the countertop is some greenery and a cute little wood sign I found at Hobby Lobby. In the base cabinets we put a bunch of my mom’s servingware and smaller kitchen appliances. Trust me, ALL of these cabinets are full to the brim! So glad we purchased so many. Before she was storing all of this stuff in the basement so it’s very convenient now. On the right side of the laundry room you can see that little weird niche I was talking about where we stopped the cabinets. Just to the right we put some hooks for the grandkids’ aprons and random things that my dad hung up in there. And my mom found that laundry room vinyl and put it up herself. So proud of my little DIYer! You can see above we kept the fluorescent lighting. I wasn’t really looking forward the work or cost with replacing them and repairing the ceiling so we left both lights as is. Luckily they fit perfectly in between the cabinets. And I should have taken a photo of the washing machine open so you could see that it clears the cabinets perfectly. We measured and marked the walls before we had them hang the cabinets. Smart, huh? 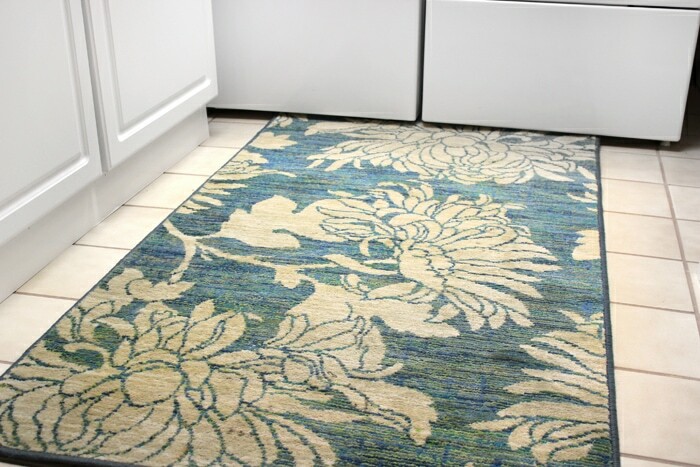 The last thing we did to the laundry room was add a colorful rug. This one is actually from our first house’s laundry room. Luckily it’s still in great shape and needed a new home, plus I love reusing old décor pieces in new spaces! Love the storage we added to her home and the amount we were able to add considering the room is pretty small. Now I guess it’s back to working on my own laundry room again, huh? 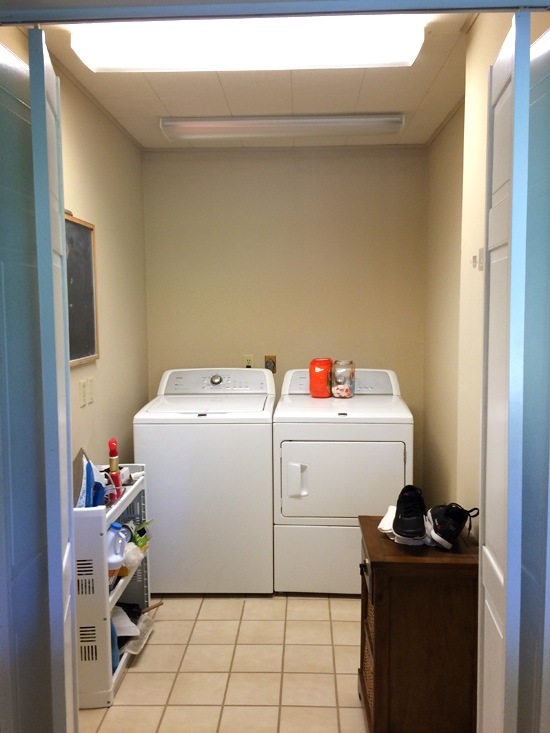 The laundry room looks great! 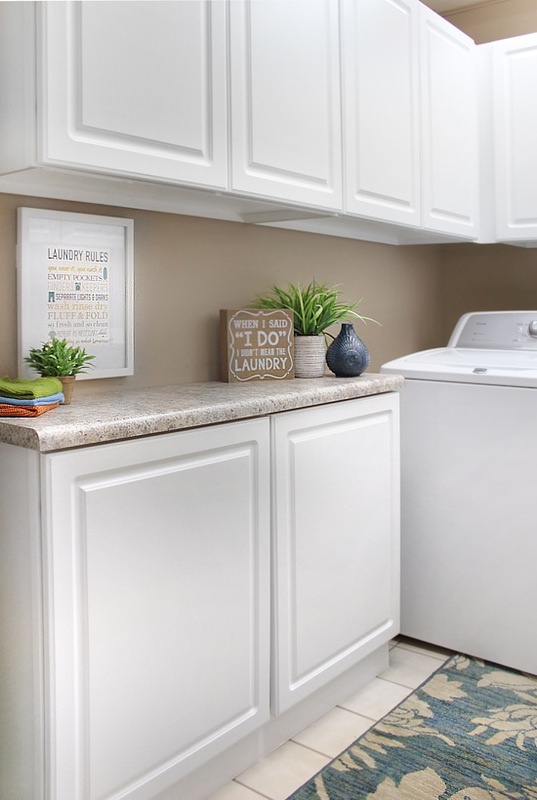 I would like to do something similar to my laundry room, which is also a small space. Would you be willing to share how much the new cabinetry cost? We’re doing a real Italian dinner this coming Sunday since they just returned from Italy two weeks ago! Definitely looking forward to that one!! Wow, that’s incredible what you fit in there. Really maximized the space! Great job. 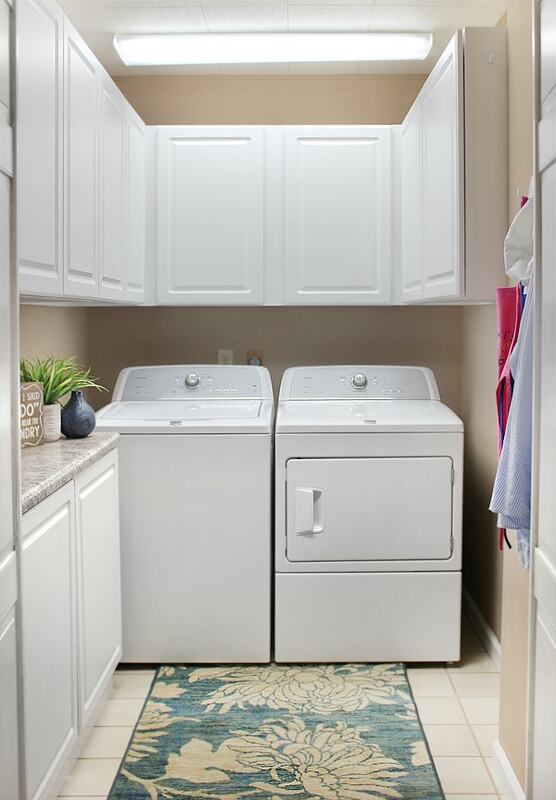 Very nice laundry room. I love the white cabinets. Do you plan to attach knobs and/or handles? My mom saw this and has a similar layout. At this time we have no plans for knobs. I think because it’s a small space and she was worried about accidentally knocking into them, especially on the lower cabinets. She told me bruises don’t heal as quickly when you’re a grandma! 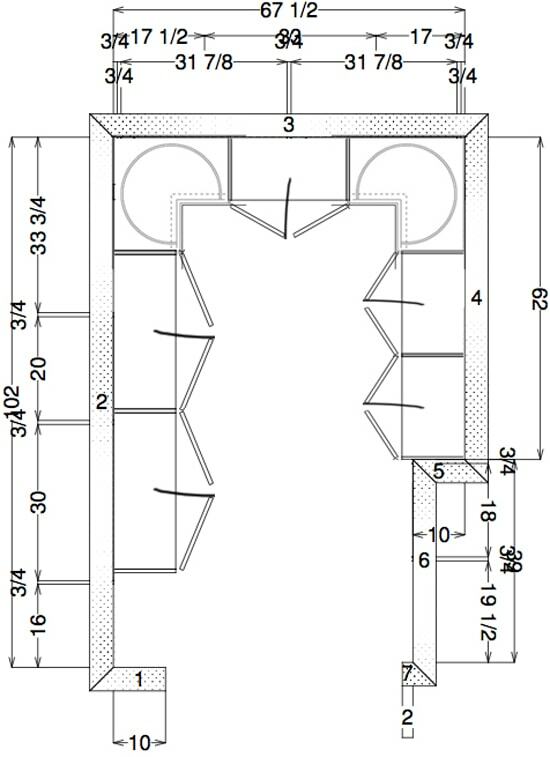 Out of curiosity, what are the dimensions of the laundry room? 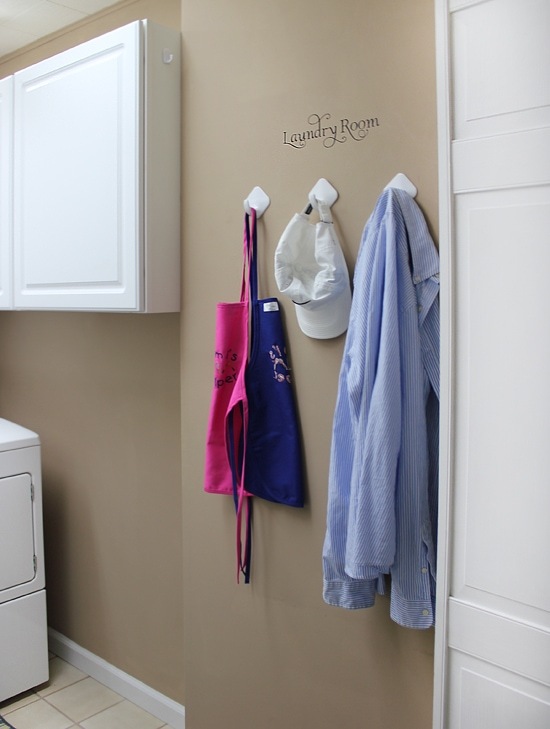 I would love to make my laundry room look just like your mom’s! 5’7 inches wide by 8’6 inches deep (but the bifold doors cut into it a bit). 8ft ceilings too! Great makeover! So great to have all the extra cabinets and it looks awesome! Wow, Erin! It looks incredible! I am making over my laundry room too at a very slow snail pace. But, getting there! This inspires me to get moving! I love your printable 🙂 – I think it’s wonderful that you gather together once a week. I love that! Thanks Flavia! It’s definitely my favorite day of the week!! That’s so awesome that you did that for your mom. 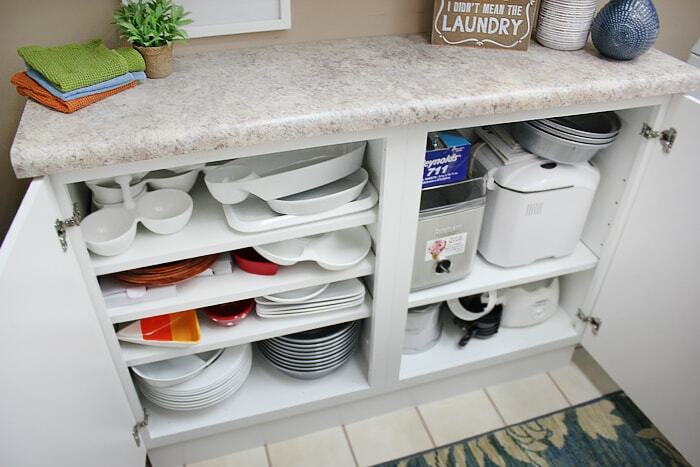 I love the storage and the counter. I’m sure she’s so grateful that she doesn’t have to trek back and forth from the basement when expecting company and preparing a meal. 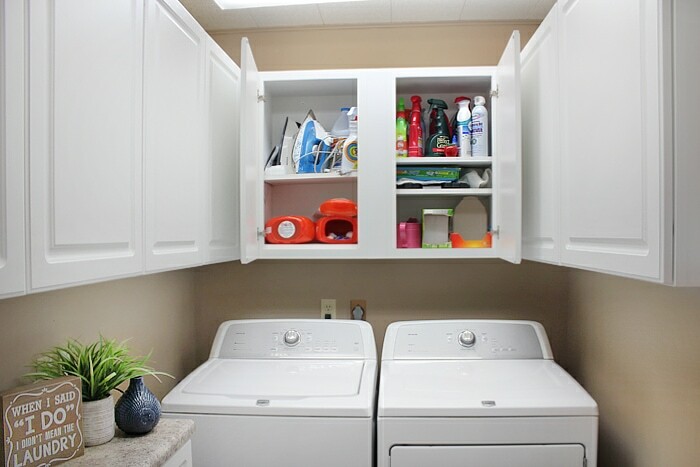 I totally have to get some cabinets in my laundry room! Thank you for this post and the pics!! The side cabinet/counter is EXACTLY what I have in mind for my mudroom. Now I can show my husband so he can see I’m not crazy!! It looks amazing! What a HUGE difference a coat of paint and some new cabinets can do. Fantastic job and I bet your mom is so happy to have extra storage. Wow – you created such an inviting space! Your parents must be thrilled! I love how much storage you packed into a small room, without it looking crowed. This is quite the transformation! I love how simple it was to make this room look totally different. I love having extra cabinets to store things. Beautiful. Gave me ideas. We are planning a laindry room.